Traveling to Mexico on a business trip can be an exciting adventure. In our last post, we talked about the common question “Is it safe?” In this post, we highlight some of the logistics you should know to keep you and your stomach safe while doing business in Mexico. When you travel to Mexico, stay at a hotel in a good location, preferably recommended by your host, convention, or mexican trade show, and preferably part of a major hotel chain. Although there are several excellent Mexican hotel chains such as Fiesta Americana and Camino Real that offer excellent accommodations, I happen to prefer major international hotel chains when traveling. 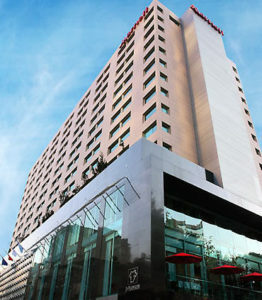 Aside from having the opportunity to enjoy elite status and upgrades from chains such as Marriott, Hyatt, IHG, Sheraton, and Hilton, these chains do an excellent job with accommodations and safety for foreign business travelers in places such as Mexico. To start, all of these chains (once again many Mexican chains are also excellent) take the safety and security of their guests VERY seriously. In all of these properties in Latin American and Caribbean countries there is a plethora of lighting and security in the parking lots and lobby. Individuals who appear to be suspect can be denied access to the lobby without showing reason to be there. And of course, guests must insert their room keys in the elevator reader in order to access their floor. Even when in Honduras and El Salvador, I never once felt a bit unsafe while on the premises of IHG and Marriott properties. Aside from their excellent reputations for guest safety, major international hotel chains are extremely consistent with accommodations for business travelers. I recall once staying at a Courtyard by Marriott in Bridgetown, Barbados one week and in another Courtyard in San Salvador, El Salvador the next. I appreciated and enjoyed having the exact same type of mattress, linens, and pillows in both locations. Furthermore, I had consistent, comfortable office chairs and ample desk space at the Marriott in both the Caribbean and Central America. In many cases, smaller local hotels have provided me a nice, hard wood chair in my room – Not my cup of tea for having to work late nights or early mornings. Please remember that when traveling to Mexico on business you will likely face pollution, different climate and elevation, new cuisine, odd working hours and possibly jetlag- not to mention local hosts that may want to take you out for late dinners and drinks in effort to show their hospitality. These factors are the perfect equation for drastic variations in your energy and mental alertness (it still happens to me when traveling internationally for business), despite sucking down a double espresso every few hours. You can hope to somewhat mitigate this by at the very least staying in a comfortable, consistent hotel chain. In addition to safety and accommodations, major international hotel chains take food safety seriously. Mexico is indeed a country where food safety can be an issue for foreigners who’s digestive systems aren’t accustomed to different refrigeration and sanitation standards as well as certain produce that may not be washed the same way as in a Western country. If you are one of those travelers that likes that free breakfast from say a Holiday Inn Express or Hampton Inn by Hilton, rest assured that these properties in Mexico prepare food up to Western sanitation standards. No matter what hotel you choose for business travel in Mexico, one of your first talks following check in should be with the concierge. Hotel concierges (as well as members of the front desk) in Mexico are excellent at recommending local eateries, attractions and nightlife spots that are close, enjoyable and safe. If you happen not to have Mexican hosts or are planning at least one afternoon or evening for yourself, ask the hotel about safe areas within walking distance from your hotel. If you are at a hotel in one of the business districts of a Mexican city, you may be surprised how safe it is to walk for several blocks from the hotel and explore some of Latin America’s most beautiful avenues, and parks. These gorgeous parts of Mexico’s major cities include Ave Vallarta and Chapultepec in Guadalajara (don’t miss downtown Guadalajara or the Minerva) as well as Ave. Reforma and Masaryk in Mexico City. 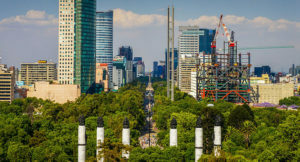 If you happen to be staying at a hotel directly on Reforma or in Polanco’s hotel zone, you are a short walk to Mexico City’s Chapultepec Park, which can safely be considered Mexico’s version of Central Park. The 1,695 acre park in Mexico City is excellent for an afternoon stroll, and equipped with forests, lakes, and a zoo as well as well as several museums such as National Anthropology museum and Chapultepec Castle, which sits on top a hill in the park with a beautiful view of the Ave. Reforma. Hitting back on the idea of staying at a major hotel chain, these properties will ensure that you do not fall into the wrong hands with regards to transportation. It is widely accepted that foreigners in Mexico should be weary of taking taxis off the street and should stick to authorized cabs called by hotels, restaurants and airport kiosks (this has especially been for Mexico City and from airports throughout the country). To be honest, the risk of foreign business travelers having trouble with street taxis isn’t very high in most parts of Mexico. However, IT’S SIMPLY NOT WORTH RISKING! When in Mexico for business, just stick to authorized taxis to ensure a safe, enjoyable stay. UBER is also safe and widely used in Mexico. Prior to calling an UBER in Mexico please take into account that your driver may not speak any English and your arrival to your destination may depend on you having put the correct address into the application. So if no one in your party speaks Spanish, an authorized taxi from a hotel, airport or restaurant in which the price and destination was predetermined in English may be a bit more convenient and hassle free. Public transportation in many parts of Mexico is cheap and safe (you would not want to think about public transportation in many of Mexico’s more violent areas where the drug war still rages). Once again, we recommend that you check with your hotel or Mexican hosts to get their recommendations on public transportation for that specific area. For our clients that do not speak any Spanish and have essentially no geographic knowledge of where they are going in Mexico City, we generally DO NOT recommend public transportation for them. In all honesty, we do not discourage public transportation out of fear that these individuals may get robbed. In Mexico City as well as most of Mexico there are subways, trains, vans and busses that are generally safe. Our main concern is in regards to these clients getting lost after getting on the wrong bus or letting the bus or train make a turn while they weren’t paying attention. The last thing that we want is for our clients to be lost and disoriented “somewhere” in Mexico City. When you’re in a foreign country and don’t speak the language and just hop on a bus or train, you might not always end up exactly where expected (It usually happens to nearly every international exchange student while they’re learning a new language and the layout of the city!!). Mexico has some of the best and most diverse cuisine in the world. 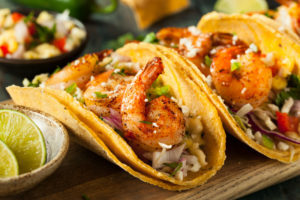 Along with its reputation for excellent gastronomy, Mexican food will always have that negative attachment to foodborne illness, the most famous of course being “Montezuma’s Revenge”. This doesn’t mean that you can’t enjoy delicious, exotic Mexican dishes that you could NEVER get back home without falling ill (an American friend came to visit me years ago and successfully ate roasted grasshopper tacos with guacamole). Once again we just recommend that you defer most of your dining questions to your hotel and local hosts while practicing a bit of common sense. As stated, your in-country hosts and hotel will only take you to and recommend Mexican eateries that will tend agree with a foreigner’s stomach. If you are adventurous with your pallet, ask to be to go to restaurants that do things that might be difficult to find back home. It might be worth mentioning to a Mexican host that you are aware that UNESCO recognizes Mexican cuisine as part of the nation’s cultural heritage. Many of the nation’s dishes are thousands of years old and are bi-products of the mixture of indigenous and Spanish gastronomy. It should go without mentioning that unless you are already accustomed, please avoid eating on the street! Although there are many street stands that are sanitary and won’t cause foreigners to become ill, it isn’t worth risking trying to decipher which are and are not safe. If you choose to eat on the street during an initial visit to Mexico, your chances of coming down with traveler’s diarrhea are at least 50%. Those tasty tacos, quesadillas and enchiladas are probably not going to send a foreigner to the hospital, but they can do enough harm to take you out of commission for several days with an upset stomach and possibly fever. We once again just don’t feel it’s worth it for our clients or other foreign business people. It’s better to enjoy the same amazing flavors of Mexico in some of the country’s delicious restaurants that tend to be kind on the foreign digestive system. 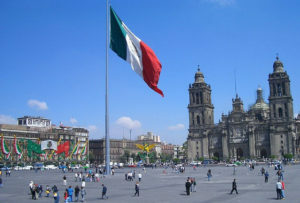 Mexico is a nation rich in culture, gastronomy and traditions for foreign business people and tourists to enjoy. From a commercial perspective, the nation has a dynamic economy and is a fertile territory for firms with Mexican business goals for sourcing, manufacturing, sales and distribution amongst others. Mexicans in general enjoy receiving and entertaining foreign businesspeople, as businesses with firms outside of Mexico is crucial to the nation’s economic health. Mexico is so committed to international trade that the country boasts free trade agreements with 45 countries, more than any other nation on earth. Yet Mexico is not without problems. Considered a middle-income country on global terms, a significant percentage of Mexico’s population lives in poverty. This poverty is a breeding ground for Mexico’s current challenges with corruption, violence and drug trafficking. As highlighted in this post, foreigners who choose to travel to Mexico on business must take prudent safety measures in order to avoid being the victims of crime and foodborne illness amongst other things. Get to know your Mexican hosts/colleagues prior to coming down and try to arrange the logistics of your trip through them. Ask them which hotels they recommend that are in safe areas and close to your place of work. Stay at a reputable, safe hotel where their staff can steer you clear of areas that may be poor for your security and stomach. If you plan on staying out late, do so preferably with locals that you know and with similar prudence and responsibility that you would exercise in any large city or foreign country. At day or night be prudent about where you go off on foot. If you have spare time to take a walk around a safe area of town near your accommodations and soak in a museum or some other cultural event, by all means give it a shot! Use common sense with transportation and take only authorized taxis. If you decide to use public transportation, ensure that you know exactly where you’re going and how to get there, and that it’s a safe area. More than anything, come with an open mind about Mexico, your clients, suppliers or colleagues, and be ready to move forward in business! Mexico and the Mexicans are most likely eager to receive you, as your business may be essential to theirs. Furthermore, Mexicans tend to be honored by foreigners who visit their country as they enjoy sharing their history, customs, traditions and gastronomy with their guests. Have a great trip!